The Ipek - A. Ipektchi was founded in 1952 in Hamburg by Abolghassem Ipektchi as a branch to Teheran head office, since 1963 business is steered from Hamburg. However, the history of the Iranian family business Ipek can be traced back much further. Already the name suggests the business field of the Ipektchi family. In Azeri the language of Azerbaijan, where the Ipektchis originate, “Ipek” means silk and the “Ipektchis” are those who work with silk. Therefore, it is not at all remote that Abolghassem Ipektchi's great-grandfather Hadji Nasrollah already lived and worked as a textile, silk and rug trader in Tabriz in the second half of the 19th century, thus setting the course for the carpet business for future generations. In 1942, the family moved from the Northeastern part of Iran to the capital Teheran and then just a few years later, Abolghassem Ipektchi moved to Hamburg, where he founded his business in 1952. The company ventured to take its first steps in Hamburg's famous Speicherstadt, which already had a century-long tradition of free port and trade. The family business found itself in the best company between Indian spice suppliers and South American coffee importers. Abolghassem Ipektchi quickly made a respectable name in the moving and international world of rug importers and, above all, customers. 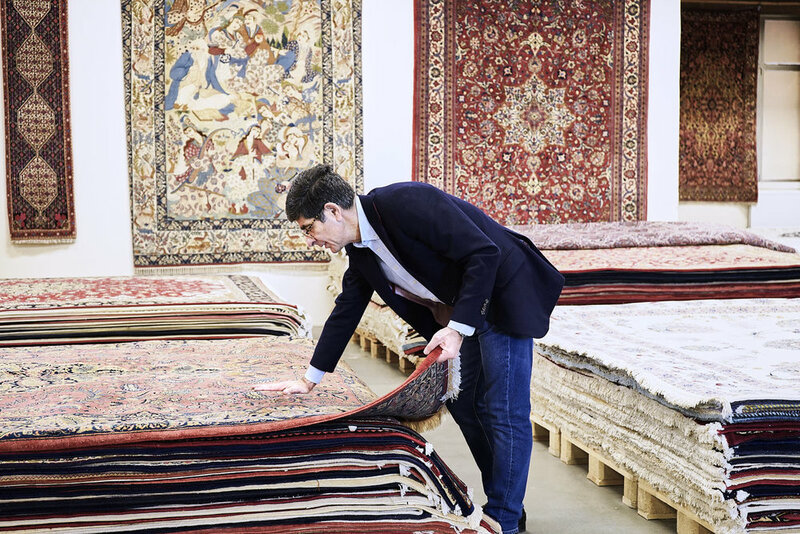 His calm nature and the correct "Hanseatic" handling of the business made him a trustworthy partner and with a great passion for his profession and his extensive knowledge, he became a respected specialist for Persian carpets, far beyond the borders of Hamburg. In 1984, Dr. Ali Ipektchi joined his father’s company to support further expansion. In the early 90s, the ever-expanding company in need of larger storing capacities, moved to a bigger warehouse in the Borsteler Chaussee in Hamburg in order to present the growing assortment. In 2007, Abolgassem Ipektchi, sadly passed away. Since then, Dr. Ali-Reza Ipektchi has been leading the company, maintaining the tradition of the rug business, now in its 5th generation.